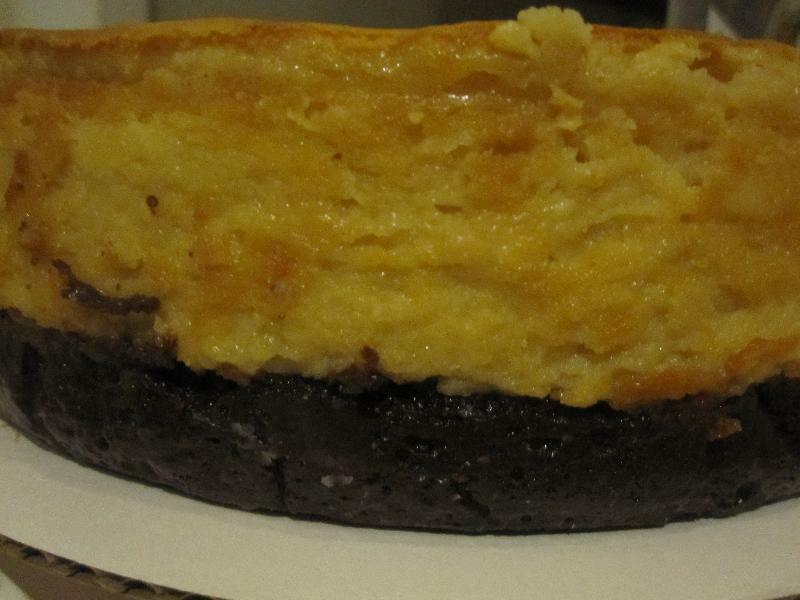 I was so proud that this cheesecake did not have any cracks. My husband said I needed to put a topping on it as it is the icing on the cake. This is the inspiration for the cheesecake filling. I then added Kahula until I reached the desired taste. I made this cheesecake for a coworker of my husband. So I sadly will not get to taste test it and find out if it needs any tweaking. Though I know the person receiving it will be sure to let me know what needs to be changed about the recipe. He is actually the one who requested this particular combination. According to my husband's coworkers this cheesecake was given rave reviews. 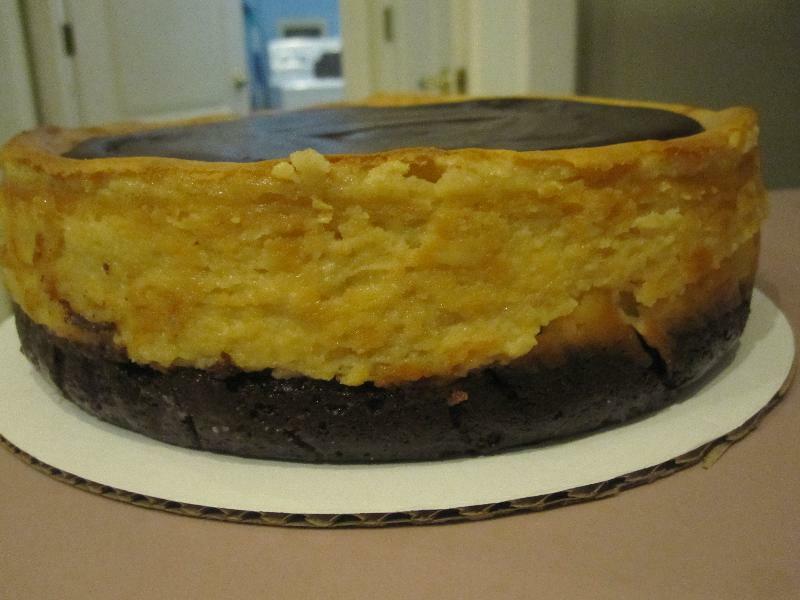 One said it was the best cheesecake I have made yet. Another said the Kahlua flavor was just right but to add a caramel swirl or caramel chips on top. When I make this again I will def try that as I as usual did not get to try a piece. Apparently it was devoured at lunch time. In a small pan over low heat melt the chocolate and the butter. (I chop the chocolate and butter into small pieces so that it melts faster) Stir until melted and combined. Next add 1-1/2 cups of sugar and mix well. Pour the chocolate mixture into a mixing bowl and add the 2 eggs, one at a time, mixing on low speed after each addition just until blended. Then add the milk and the vanilla; mix well. Combine the flour and salt. Gradually add to chocolate mixture, mixing after each addition just until blended. Spread evenly into greased and floured 9-inch springform pan. Bake for 25 minutes. In a large mixing bowl, beat the cream cheese and sugar until smooth. Gradually beat in the cream. Next add the eggs; beat on low speed until combined. Finally add in the Kahlua and beat on low until combined. Pour on top of the brownie bottom and bake at 325 for 55-60 minutes or until the center is almost set. Place the chopped chocolate in a small bowl to make the topping. In a small saucepan, bring the cream to a boil. Pour over the chocolate. Whisk until smooth. 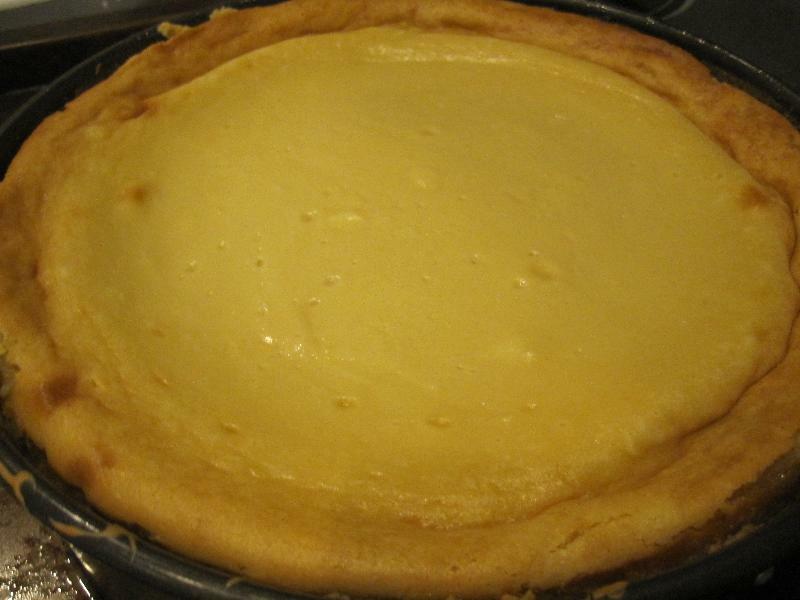 Cool slightly and then pour on top of the cheesecake. Cover and chill overnight. Remove sides of pan.